The Learning Centre hosts an exciting program of events including academic lectures and seminars, symposiums and conferences, workshops, presentations and much more. 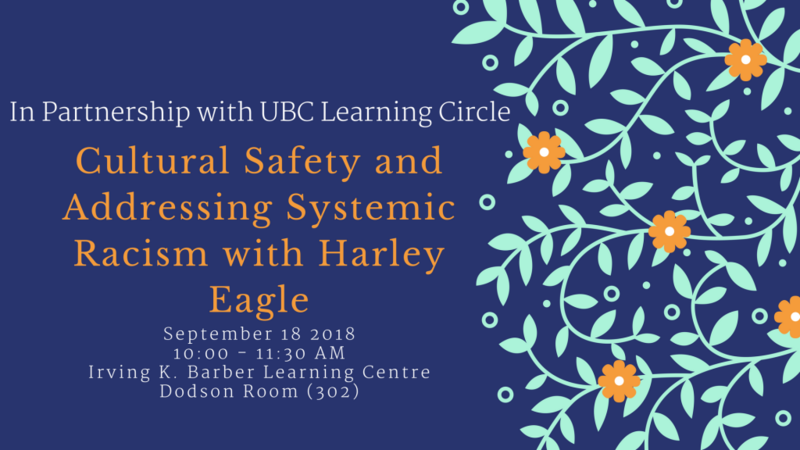 We welcome Harley Eagle to the Centre for Excellence in Indigenous Health, presenting from the UBC Centre for Teaching, Learning, and Technology, and live streaming through the UBC Learning Circle for a conversation on cultural safety and addressing systemic racism. Indigenous people experience racism in health and educational settings. This webinar will focus on why understanding the dynamics of Indigenous specific racism is essential to ensuring Cultural Safety. 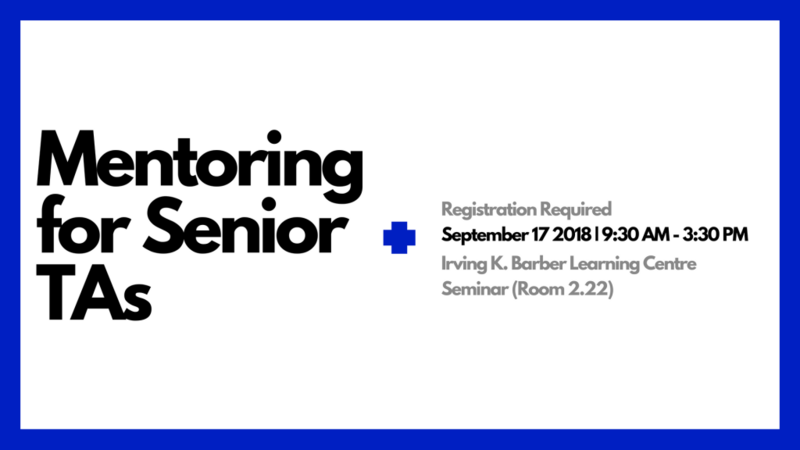 This workshop is meant for senior TAs who will be serving, formally or informally, as mentors for other TAs in their department. During the workshop, you will focus on developing specific mentoring skills. The early part of the day will focus on setting up the mentoring relationship, and the latter part of the day will focus on 3 core mentoring skills – feedback, reflection, and skill modeling. The training is highly intensive, and to take part, participants will need to commit to being present for the entire duration of the workshop. 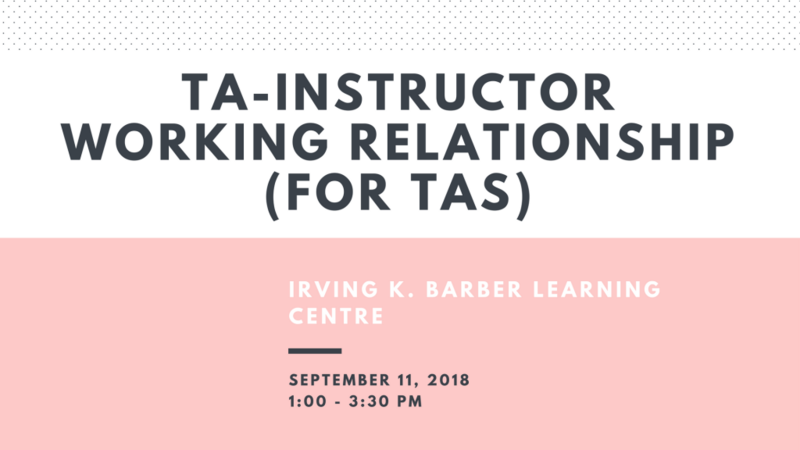 In this session we will explore the various needs and expectations (including the TA contract) that structure the TA-Instructor relationship, develop effective communication strategies, including feedback and building professional interpersonal skills, all with the aim of helping you to build a harmonious and rewarding professional relationship with the instructors you work with. Room TBA. 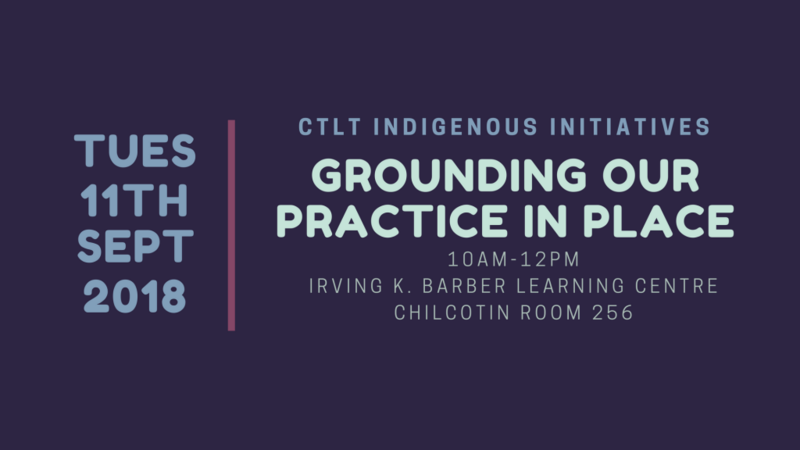 The Centre for Teaching, Learning and Technology (CTLT) Indigenous Initiatives team will be hosting their first kick-off event for the academic year, Grounding Our Practice in Place. This session will highlight positionality and place through educational resources as well as share new offerings for the upcoming academic term.  Special guests across campus will be invited to share about resources and recent initiatives. Ten years ago, the Irving K. Barber Learning Centre (IKBLC) celebrated its grand opening on UBC’s Vancouver campus. As a technology-forward place of learning, the four-story building is a focal point of education for students and researchers and has become an innovative fixture on campus. In celebration of this 10-year milestone, UBC Library is installing two temporary exhibitions on Levels 1 and 2 of IKBLC. 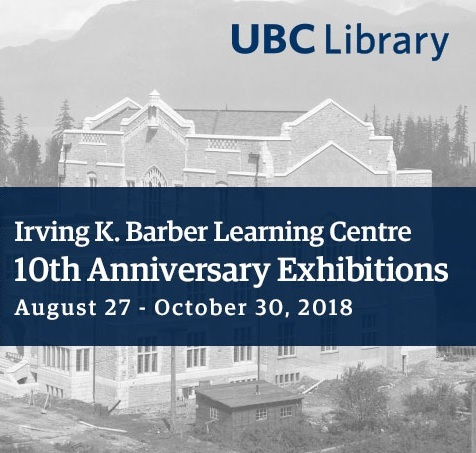 The Irving K. Barber Learning Centre 10th Anniversary exhibitions are on display from August 27 through October 30, 2018. Registration for the WAITLIST of the August ISW opens on Monday May 7 at 9am PST and closes on Friday July 27 at 4:30pm. Registration for the WAITLIST of the September ISW opens on Monday July 30 at 9am PST and closes on Friday August 10 at 4:30pm. 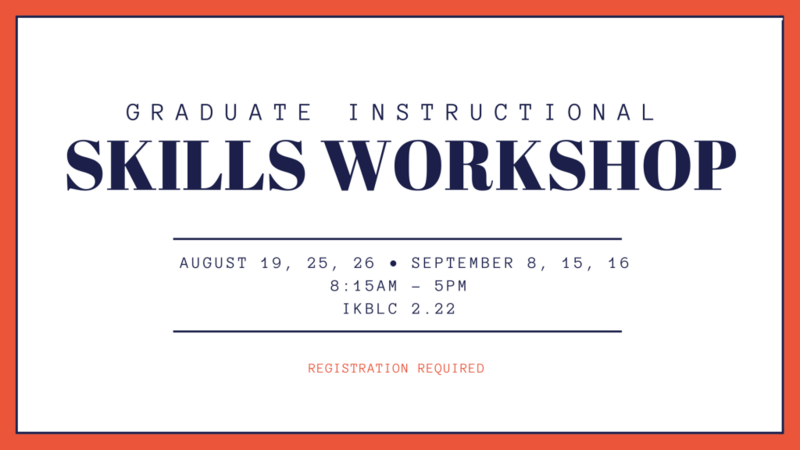 This 3-day workshop consists of teaching practice, theory application, and topical sessions specifically relevant to Teaching Assistants and Graduate Students at UBC. During the workshop participants will teach 3 short lessons and receive feedback from their peers. Participants will work closely with peers and trained facilitators. In this supportive atmosphere participants will have a chance to begin to develop new teaching skills, to enhance existing skills, and to try new ideas. Lost momentum? Having difficulty managing your research efficiently? 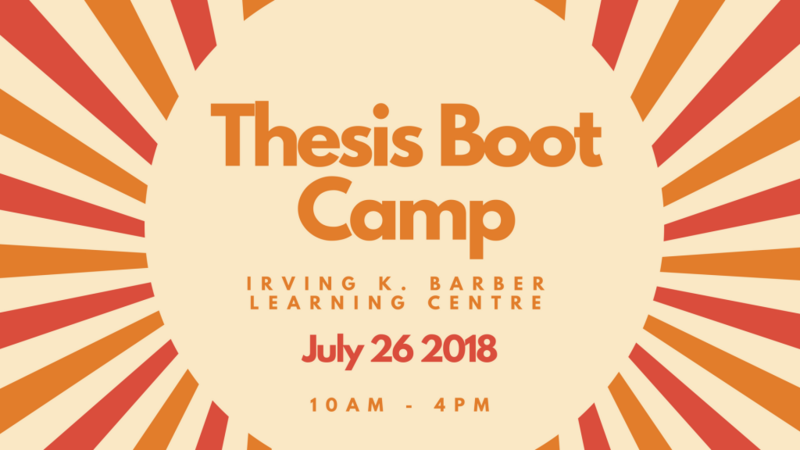 Need motivation and strategies to complete your thesis? 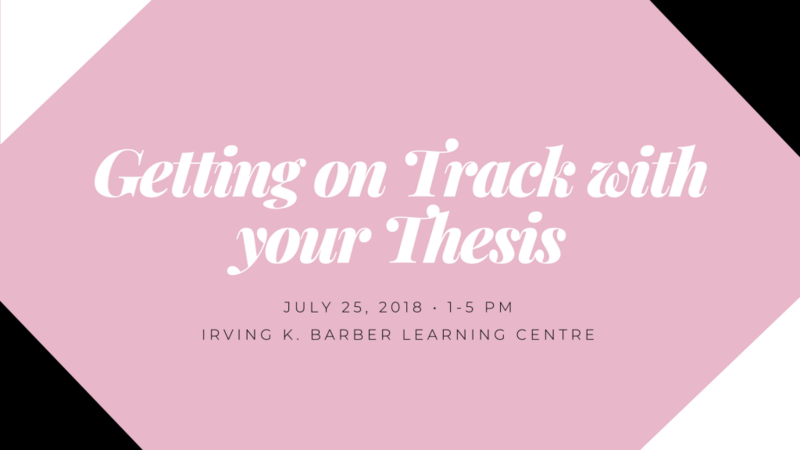 This workshop will offer information to graduate students on how to: Efficiently structure the thesis or dissertation process for timely completion; manage the emotional roller coaster; and find support when your motivation ebbs. Art and cultural exhibits at the Learning Centre are curated to delight and educate visitors — and reflect UBC’s mission to create exceptional learning environments and serve the people of British Columbia, Canada and the world.